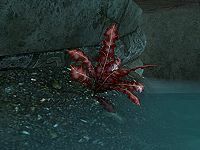 Crimson Nirnroot is a special variant of nirnroot that can be found exclusively in Blackreach. It has the same alchemical properties as normal nirnroot (other than details of the two damage effects). Similar to regular nirnroot, the crimson variety makes a humming sound that lets you know when a plant is nearby. Aside from the unique jarrin root, crimson nirnroot creates the largest magnitude damage health poisons in the game; see the alchemy effects page for full details. It also makes the largest magnitude damage stamina poisons in the game. Already-harvested samples of crimson nirnroot are not available. There are none sitting out on tables or shelves, and they cannot be bought from merchants (even with the Merchant perk) or found in random loot. However, after completing the quest Smooth Jazby for Avrusa Sarethi, she will start growing them alongside regular Nirnroot at Sarethi Farm, where they can be periodically harvested. 1 in the Derelict Pumphouse (requires you to activate a valve to lower the gate). 1 in Sinderion's Field Laboratory, inside a pot. 1 in the Silent Ruin, inside a pot. In a tunnel in the stream near the Hall of Rumination. On a platform above the Hall of Rumination, accessible by traveling through the hall to the elevator, then through the door. The plant is in a pot, behind the entrance. In a pot west of Derelict Pumphouse at water level and against the edge of the cavern, near a small shrine. Near the elevator to Skyrim north of the Derelict Pumphouse. The plant is located east of the elevator, below the falls and at the water's edge. West of Raldbthar Deep Market at the bottom of the waterfall and at the river's edge. West of Raldbthar Deep Market in a lake at the bottom of the falls is a small island. On the island there is an entrance to the Derelict Pumphouse. Starting from the entrance to War Quarters, head south, down and then up the stairs. The plant is on the ground to the right. Northeast of War Quarters, you will see a small building. The plant is at the bottom of the steps leading up to the building. Several steps northeast of the previous root. Southwest of the entrance to Raldbthar Deep Market in a stream, at the top of the waterfall. Two near the entrance to Reeking Tower (which is northeast of Silent Ruin). On a platform above the Reeking Tower, accessible by using the elevator inside the tower. East of Reeking Tower and northwest of Sinderion's Field Laboratory, near the top of a waterfall. South of Tower of Mzark, near the water by the Falmer camp. From the Falmer camp at the bottom of the Tower of Mzark, get into the water and travel in the direction of the main waterfall (To the right of the waterfalls coming from the building). There will be two plants. The first is on the right, in a pot at a little mini shrine-like alcove (watch out for the guardian). The second is on the left by the waterfall. Near the bottom of the stairs descending outside of the Tower of Mzark, one flight up from the lake. Right in front of the Alftand elevator. A few steps north from Alftand elevator, down a small stair. Northeast of the Pumping House, across the wooden bridge. 30 samples are needed for this quest. Crimson nirnroot and regular nirnroot are not affected by the Alchemy perk Green Thumb, and therefore even with the perk, you still only collect a single sample from each plant. Combining Nirnroot and Crimson Nirnroot will unlock all ingredient effects for both plants. This page was last modified on 17 March 2019, at 15:58.